I have made about 35 boxes of mooch cards and 100 boxes of bookmarks available for mooching in the USA. I am only sending these cards to moochers who give a little. Our printing costs for these cards is quite high (about $20 per box, plus postage to us, and then to you). This will use up most of the remaining stock of cards, and about half the stock of remaining bookmarks which were printed last year. Brits: there are plenty of bookmarks and mooch cards available for mooching being sent from the UK. The good news: the BookMooch app for the iPhone is all finished. The bad news: I can’t let anyone use it, because Amazon has decided that only they get to have an iPhone app that displays their book data. Worse yet, Amazon has been recently enforcing this position and threatened both Delicious Monster (twittered) and Pocketpedia with total suspension of all access to Amazon’s book data unless they complied (both did as Amazon requested and pulled their iPhone apps). Amazon recently changed the book information feed that BM (and others) use from being called “Amazon Web Services” to now being called the “Product Advertising API”. They also changed the terms of service to be much more strict: “You will not use the …Data Feed…in any… manner, that does not have the principal purpose of advertising and marketing the Amazon Site and driving sales of products and services on the Amazon Site.” It’s unfortunate that they’ve decided to become less open, and this change of theirs affects a large number of book-related web sites. It’s also arguable that Delicious Monster, Goodreads and BookMooch are now in violation of this new clause, since all these web sites have a more engaging “principal purpose” than advertising Amazon. There are a small number of iPhone apps that search Amazon available on iTunes, but all of them seem to do nothing more than “search for book, find it, click *buy*” — ie, they really are nothing but promotional vehicles, and it seems that Amazon doesn’t pursue them. I found out about this a few weeks ago, but by that point I was already about 70% finished doing the iPhone app, and was in a $2700 contract (having paid half already) for the completion, so I couldn’t back out. What I’ve done is to get the iPhone app finished, and now wait and see if Amazon changes its position. Alternatively, if BookMooch didn’t use Amazon’s book information, we could do as wanted and release the iPhone app right away. I’m looking into other sources for book data, and this might be the way we go in the future. BookMooch currently refers about $20,000 a month worth of book sales to Amazon and we receive a sales commission for doing this, which partially funds BookMooch’s expenses. If BookMooch stopped using Amazon’s data, we would need to grow the monthly donations by about 40% to cover the loss in commission revenue, and we might possibly need to raise money to pay for the book data, if we went with a source of book data that charged monthly fees (most book-information data sources do charge). It might help if moochers contact Amazon’s customer support and write “I urge you to change your policy regarding not allowing web sites to build iphone apps if they use the Amazon Product Advertising API. Your policy is making me feel bad about buying from Amazon.” Or something to that effect. 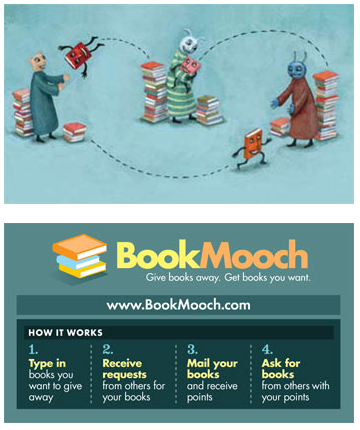 Below I’m including some screen captures of my using the BookMooch iPhone application.